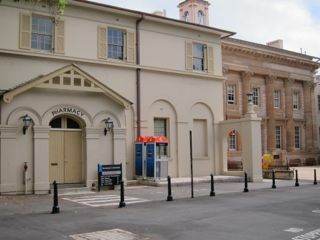 Beyond the Badham Building is the neo-classical Bank facade, now largely fronting an extension of the Pharmacy Building next to it, and dating from 1889 – 91. The main Pharmacy building was originally built in 1889-91 for Professor Archibald Liversidge in rendered brick as the chemistry building with special rooms added such as a balance room. The slope of the site was used so that there was one storey to Science Road and two to the back. It was regarded as the cutting edge of design for Science teaching in Liversidge’s time. Unable to build a new Chemistry building Wilkinson retained the porch of the existing building, added another storey and converted the panels into a blind arcaded treatment and stuccoed it in Mediterranean style to create a neoclassical style frontage to Science Road. 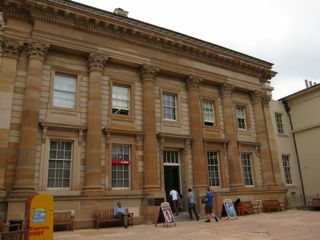 He then linked it to the Badham building with the bank (CBC) façade. Between Badham and Pharmacy is a staircase down into the tunnel that has become the graffiti tunnel where there is a free go for painted advertisements for current university events and the like. Beyond Pharmacy is a block built in the 1920s originally built for chemistry but taken over by administration in 1958. Outside this is a relocated milestone that says Sydney II miles on one side and Parramatta XIII on another.